I know it sounds too techy for most of us but the point is clear. Eventually we will do our “Varitone Shootout” and maybe draw some conclusions based on both science and our own ears. 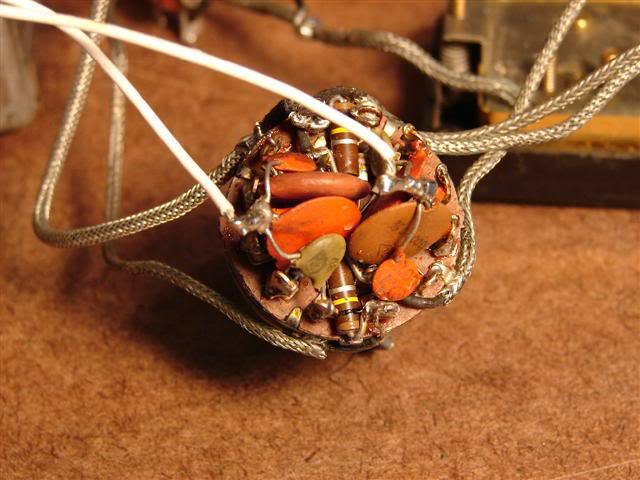 The second type has big multi value "circuit chips" like the orange things in this photo. I've seen blue ones too. Still plenty of stuff to go wrong but a lot fewer solder joints. Would you pay 14 large for this repaired guitar? I'm guessing no. Nice case though. Looks like a wide 'board to me. This could be a very cool player and I'll bet it would sell in a heartbeat if the owner priced it right. I get people looking for wide neck 65's all the time. sunburst, block markers, two pickups and the name Gibson on the headstock-it must be worth the same. True, that doohicky that holds the strings is different on mine but how much can that change the price?” There’s a certain logic to that thought that is undeniable. The guitar is probably a 65. It could be a 66 but the peghead angle looks like it might be 17 degrees and the nut looks like it might be the wide one. So, here’s a guitar that may only be a month older (or a year) than the ones for $14,500 to $28,000. It isn’t illogical at all for a seller to think “well, if that one’s worth $28K-which it isn’t-, then mine, even with the break should be worth at least half that.” There’s nothing wrong with that logic other than the fact it’s wrong. Logical, but wrong. First off, the $28K one isn’t worth 28K and most people look at asking prices instead of taking the extra minute to look at sale prices of completed listings (go ahead, take a look. Not too many are selling are they?). And how logical is it that a repaired headstock would cut the value in half (If I had a 57 Jaguar XK-140 with a repaired transmission would it be worth 50% less?). Actually, it’s about as logical as a refinish cutting it in half (if I had a ’57 Jaguar XK…oh, never mind). But that’s how it is with vintage guitars. There is no less logical collectible out there. Antique furniture gets close. The seller does himself (or herself) a huge disservice by not doing the homework. First off, they paid way too much in listing fees. Second, they destroyed any credibility they may have had with serious buyers. Third, they just look clueless. At least they didn’t do the “tone for days” thing. The thing that surprises me most is that the seller seems to know about gear. This isn’t Aunt Molly selling Uncle Lou’s old guitar now that he’s passed on. That I get . Here’s what I think it’s worth at retail. If it’s a wide neck 65, it’s worth around $3000-$4000. If it’s a narrow neck 65 or a 66, it’s worth $1750-$2500. The range is due to the fact that I don’t know how serious the break was or who did the repair. I also did something on this listing that I don’t usually do. I wrote the seller and told him he was high. I probably could have phrased that better. Then I told him to go to this web site and start reading. Here's what I got. The neck join sure looks good but I'd like to know how the darker paint got on the bass horn. This is a 62 Les Paul SG. My contention is that SGs don't have darker paint anywhere. No, I’m not turning into an SG guy, nor am I going to start writing about SGs and change the name of the blog. But I really like SGs and they have recently dropped in value like a lead balloon. They ran up quick and they ran down even quicker so they can nbe had for a reasonable price. 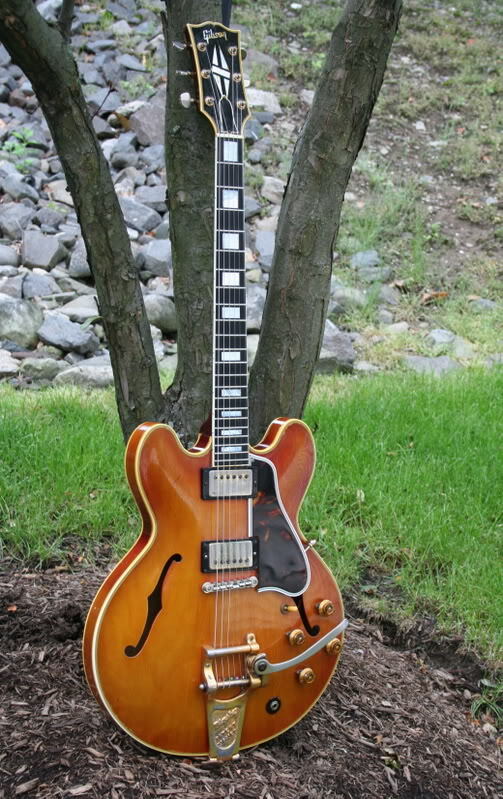 One of the reasons I like ES 335s and their brethren is because people don’t mess with them. The harness is too scary to pull out, so folks leave them alone. Not so with SGs and Les Pauls. But beyond that, SGs have their own set of unique problems and, since I’ve acquired a few in the last month or so, I’ve become an “instant expert”. That means I’m not an expert but I’ve started doing a lot of research. The elephant in the room for an SG is the neck join (or joint if you prefer). 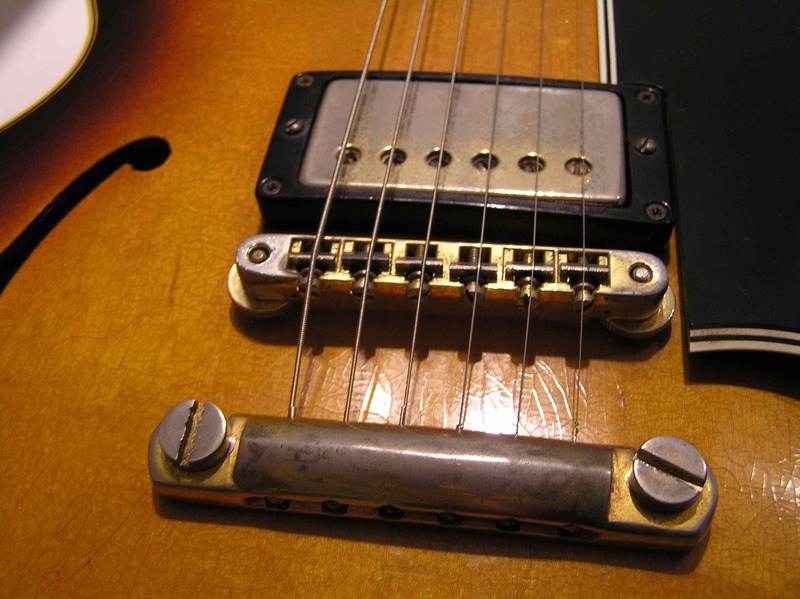 There are at least 4 different neck join types used from 1961 until 1969. maybe even 5 types. What seems to make them so prone to breakage is the fact that there really isn’t a true tenon. The neck attaches to the body (into 1966, anyway) with a flat”tongue” of sorts. A Les Paul and a 335 neck is glued to the body on three sides. The SG has only one glue surface and it isn’t that strong-OK, there are 3 surfaces but the “sides” are so thin that it doesn’t do much to strengthen the join-most of the glue is on the underside. 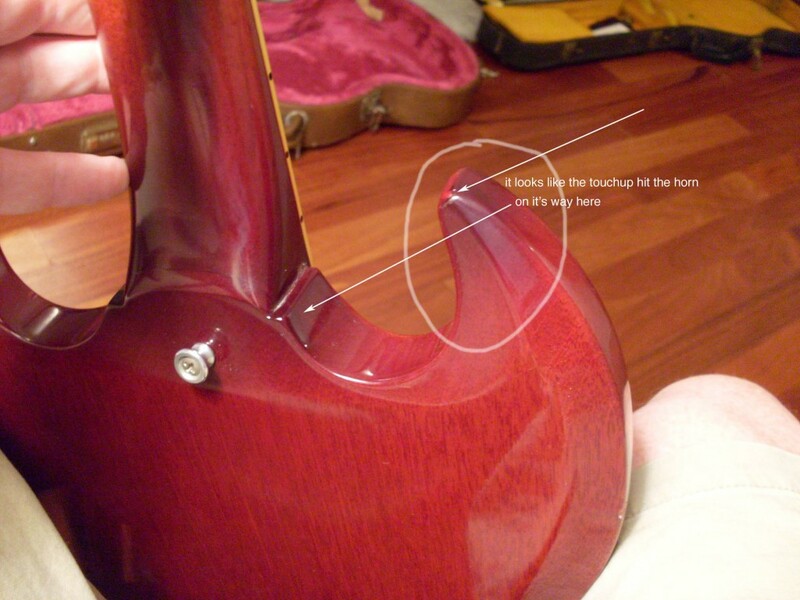 Sometimes, the glue gives up and the neck is held on by the strap button screw. Other times, it takes a shock and breaks, usually right where the neck attaches to the body. So, a lot of them are repaired or reset. What’s the difference? In my mind, a reset means there was no broken wood-only broken glue and finish. A reset SG can still bring some serious coin but it should always be disclosed. 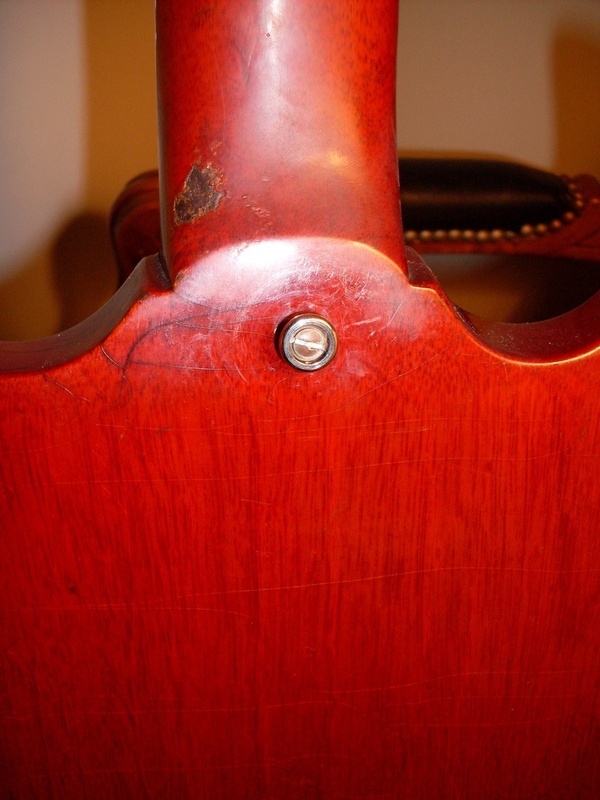 A repaired SG is subject to the same market devaluations as most vintage guitars. The hard part is determining just what, if anything, has been done. I’ve already told the story of the broken 64. This is the story of a 62 that is in beautiful shape that I bought as a “never broken, never repaired, never reset” husk with some parts (everything but the electronics and the bridge, actually). When I got it, it looked beautiful and I was pleased. There was no sign of any break. But I noticed that the area around the neck join was darker. It didn’t bother me at first since you see that on red 335’s all the time. But when I took out my other SGs and looked at photos of others I’ve owned, I saw that none of them had a darker color finish at the neck join. I also thought about why a 335 would have it and I came to this conclusion: On a 335, the neck join is a piece of maple (plywood) attaching to a piece of mahogany. You will see the change in the way the wood takes the paint/dye unless the finish is made opaque at that point. 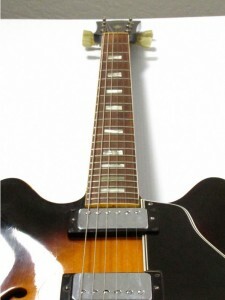 A sunburst 335 is usually black at the join and a red 335 is darker red. No reason to do this on an SG-its all mahogany. So why the color change on this one. I did the black light and it was inconclusive. So, I looked with my own two eyes. The “tell” here was a bit of darker paint that hit the treble horn on its way to the neck join. You can clearly see where the original paint (dye) ends and the overspray begins. A magnifying glass and a few macro photos helped. I need a better camera for macro work, however. Anyway, my conclusion is that the neck was reset. There is no sign of a break and the work is near perfect-a beautiful job. But I know it was worked on and I paid for an original piece. I paid a good price but still, I didn’t get what I thought I was getting. I contend that SGs have no dark paint at the neck join while the seller of the guitar (a dealer) contends that some SGs have this feature. We aren’t at each others throats, it’s just a dialogue-as it should be. I’m certain it will be resolved amicably-dealers are used to this. The truth is every time I play an early 60’s SG, I remember why I like them so much. Every time I buy one, I am, reminded of why I’m a 335 guy. 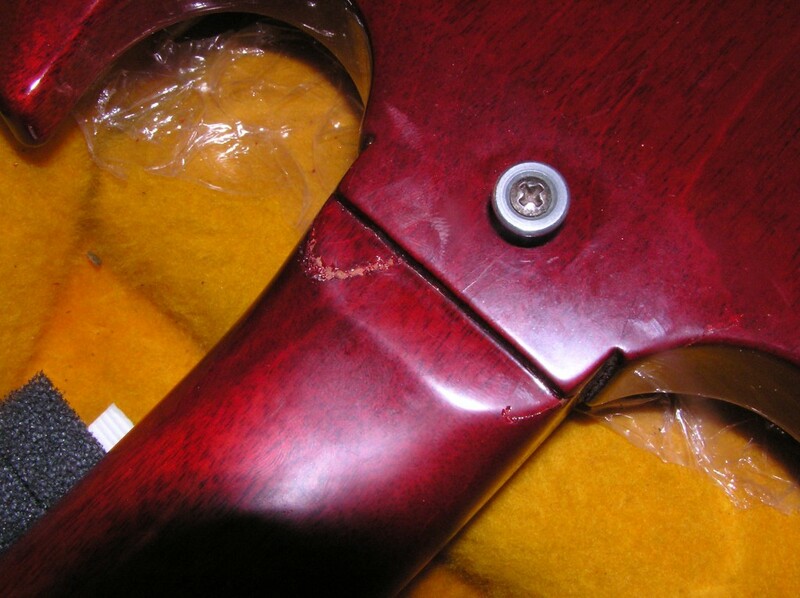 This is the neck join on a 63 I had for awhile and sold. One of the best of the best I've had. Great neck. No dark paint. It certainly could have been worse but the damage is done. 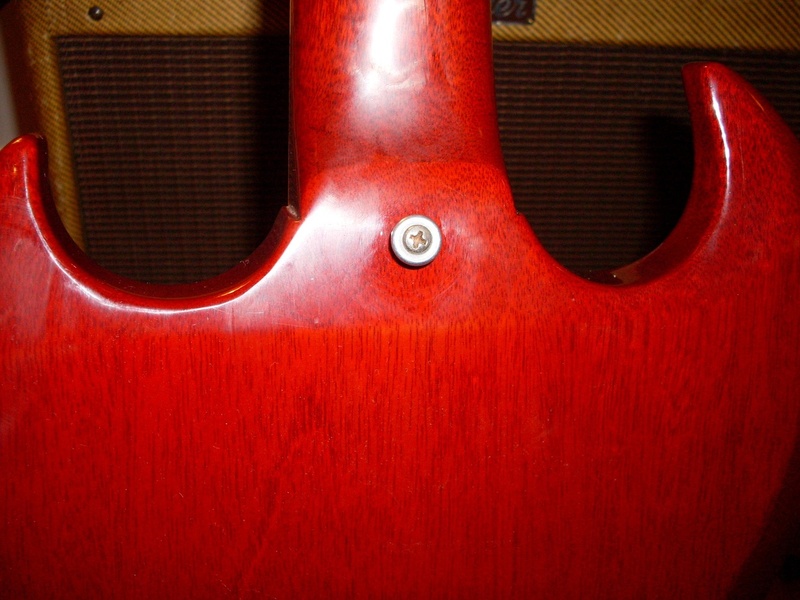 The vintage value is generally cut in half when there's a neck break even on an SG where breaks like this are common. Off it goes to Dan Erlewine (and Elliot) for the best repair money can buy. I'm not sure why anyone would paint their '62 dot neck this color. It's a nice color but it seems all wrong for this guitar. The real problem is that it's a killer player. As a dealer, I'm not supposed to fall in love with my guitars but this is astonishing. Why didn't they paint it, say, black? It looks a lot like Gibson's factory Sparkling Burgundy, actually. I don't know who painted it but it sure looks a lot like the SB 345 I had a while back. This question comes up a lot. The whole question is “what’s more important-how it looks or how it plays (sounds)?” The answer isn’t a simple one. If you’re a collector, you really want both. A mint guitar that has a serious playing problem will be a lousy investment. That’s why if you are paying top dollar, you buy from someone you trust or you play it first or you get an unconditional approval period. But supposing you have a refinished dot neck with all original parts that plays like a motherf**cker? The conventional wisdom is that it’s worth half but that’s not really fair in this case, the way I see it. 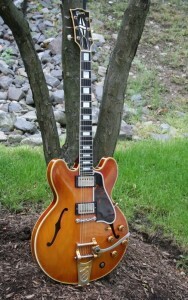 Or suppose you have an all original finish 335 with no original parts that plays like a mofo. How do you put a value on this? There is certainly an advantage to the latter since correct parts are readily available but you can’t unrefinish a guitar. I had a dead mint 61 not long ago that I really wasn’t enamored of. It looked great but it was kind of plunky. It just wouldn’t sustain. But, by the conventional wisdom, that one is worth at least double the others. I think we need to start stressing the tonal and playability aspects of these expensive and collectible guitars a bit more. Part of the problem is, of course, that it’s so freakin’ subjective. I might find a certain guitar blows me away but you might say “ehhh”. I wrote about all those descriptive adjectives that are so rampant in the Ebay listings and came to the conclusion that it’s all pretty meaningless. Until I see a listing that says “looks great but sounds like a piece of crap” I’m going to be wary of the tonal hyperbole. There are plenty of great looking guitars that play great as well. I recently acquired a blonde ES-345 that I wrote about. Great shape, great player-no problem. All systems go. But I also just got a refinished candy apple red early 62 dot neck that plays like God himself built it (I don’t think he painted it though). It isn’t the best sounding 335 I ever played but it just plays so damn well. Perfect intonation, great neck, perfect action, loads of sustain and a fret job to die for. If I swap out the pickups, I’ll bet I can get this to sound like it was built by God as well. Another set of PAFs? Maybe but it’s still a refinished guitar. Maybe that set of Sheptones that’s just sitting around? In any case, I know I can make this into a killer guitar but how do you assess its value? It plays better than at least 90% of the guitars I’ve had this year but I have to value it so far below the market that it just doesn’t seem fair. I suppose I could part it out, get back my investment and rebuild it with repro parts and keep it as a player. This is the better problem to have, I think. Can you imagine paying top dollar for a mint 335 (sight unseen, of course) and have it sound like that old Teisco you had when you were 13? It happens. It’s fortunate that these guitars are so consistent-the chances of you getting a bad one are pretty slim and almost zero when you buy one thats got some serious player wear. But that refin you can buy for $9000 has every chance of sounding as good as that mint one for $25,000. Better, in fact because someone had to have played it enough to have it need a refinish or liked it enough to spend the money to change the color. But Candy Apple Red? Not black? Or white? or Pelham blue? really? In the end, most of us play our guitars more than we sit around looking at them. My conclusion? I’d rather have a great sounding guitar than a great looking one but they aren’t mutually exclusive. I’d really rather have a great sounding guitar that looks incredible too. Where’s that old red 59 345 I used to own? Check this out-it's owned by a friend of the site named Brad who has some very cool stuff (wait til you see his 58 335) Looks kind of Gretschy, doesn't it? that’s what I think happened, although I’m surprised that any of them had actually faded enough by 1960 to elicit much complaint. So, maybe, they just changed suppliers and the new dye held up better. I tried to ask the folks now at Gibson but they didn’t have an answer-they weren’t there. It os clear that the 2 varieties of dye age very differently. I’ve owned a number of red 64’s that seem to get very dark-more maroon than red and some even head toward brown. Others stay that very vibrant, almost blood red. It seems that sunlight is the culprit on the later ones. The earlier ones do all sorts of odd things. The earliest ES-355s, which were the first Gibson to get the red paintjob tend to turn almost Gretsch orange. I know the owner of the first ES 355 ever to leave the factory and it is quite orange. the second one is too but not quite as orange. My beloved former favorite guitar in the world-the über-rare red 59 ES 345 was played its whole life by a pro player and spent very little time in its case but it didn’t turn orange. It was called “The Watermelon” with good reason. It was kind of dark pink with yellow streaks in the grain. I had a very cool ’60 that did the same thing-also pro owned and played its whole life. There are five known 59 red ES-345s. You won’t find too many 335’s with the early red since they only made four or so in 59 (none officially) and there aren’t many 60 red ones either. 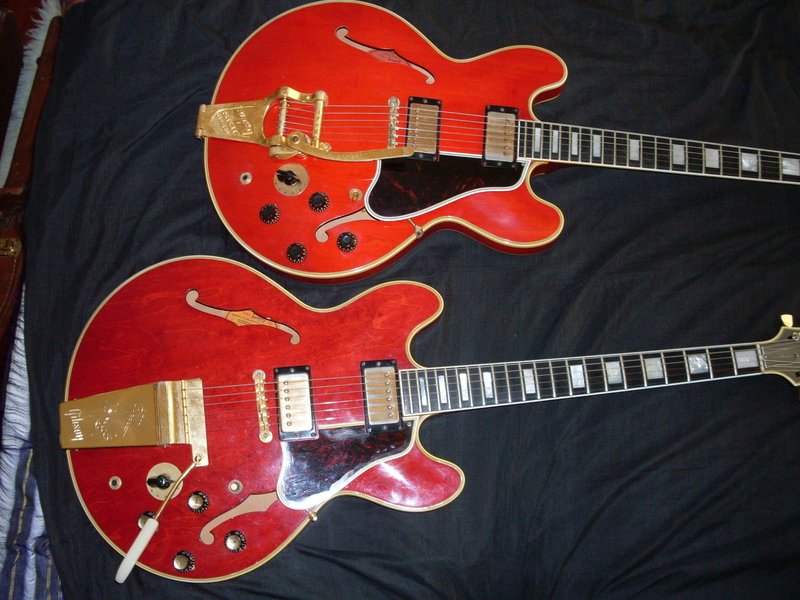 Of the only 21 red 1960 ES 335s made, I have no idea how many were made before the changeover but I’m guessing 5 to 10. I’ve seen only one 60 335 with the old red. 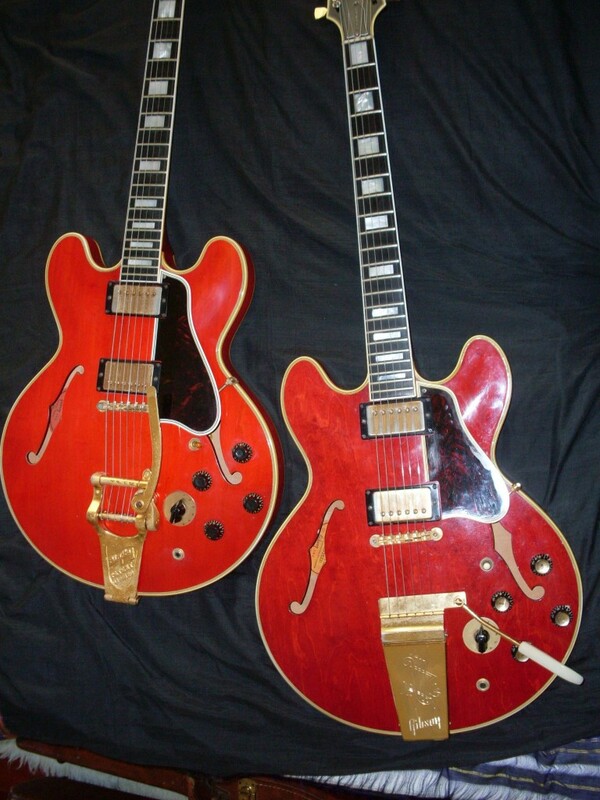 There is one red 58 ES-335 that was a special order (in stereo!). The prettiest damn guitar I've ever seen. Wish I still owned it. This photo almost captures the stunning color. Sort of a faded watermelon reddish sunset orange-pink. 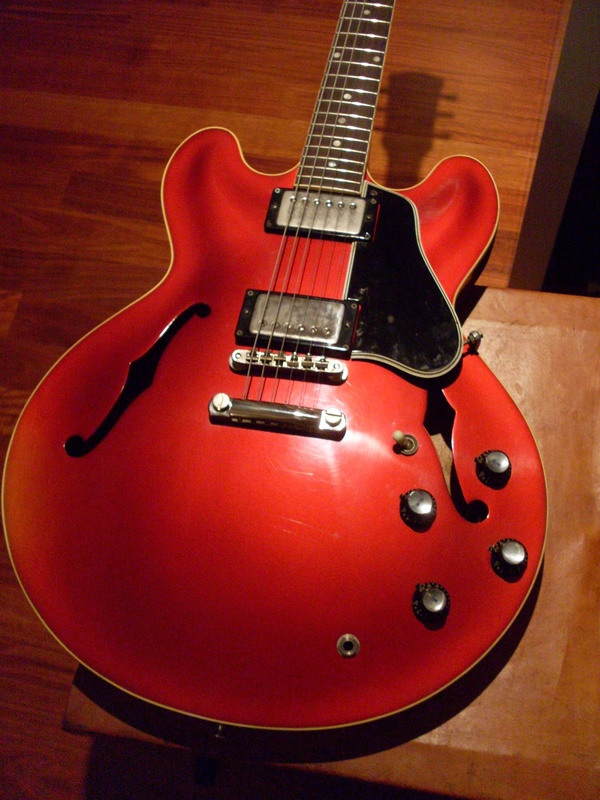 It is the first red ES-345 known to exist. OK, I admit it. I’m a sucker for blondes. My wife is a blonde. Most of my ex-girlfriends were blondes. Hell, I’m a blond or at least I was when I had hair. Blonde 335s and 345s are the ones we drool over. They are rare, expensive and beautiful-not unlike some of the…”oh, hello Sweetie…nothing, just writing my blog post…” Never mind. Anyway, the handful of blonde 335s and 345s command a big premium and it’s easy to see why. Out of the 135 or so ES 335s and 345s I’ve owned, I never owned a blonde…until today. The early 60 that was listed on my Gbase page wasn’t mine-it was a consignment. Not any more. Now, I own it. What’s the big deal anyway? Everybody knows I love a red guitar but this is special. Not just in its cool blonde rareness but in a cachet that’s hard to describe that, while certainly borne of the rarity, is not limited to it. By now-50 odd years later, nearly all vintage pieces of this value and rarity that come to market are in the hands of collectors or will be bought by collectors. The players will go for the sunbursts and the red ones or the Historics. You can’t exactly bring a $30,000-$80.000 guitar on a gig unless you have a very large insurance policy and a bodyguard. So, what I think is going on here is a kind of reverence that was once reserved for ‘bursts and a few acoustics. At least for me. Is this old girl a tired old 50 year old? Not a chance. This one has been played and, yes, revered. The only reason the last owner let it go was to buy, what else, a ‘burst. It ain’t perfect but it sure does play. A fat pair of double whites and a big ol’ 59 neck doesn’t hurt either. In fact, this was one of the first 50 guitars made in 1960 which is, of course, why it still shows the old style knobs and the big neck. That would change in short order. How rare are these babies? 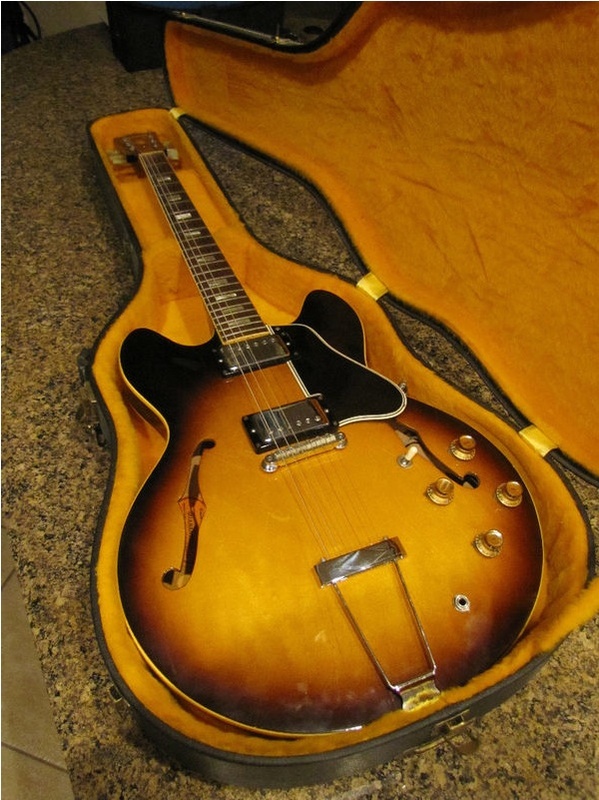 There are 209 blonde ES-335s and just 50 blonde 345s. Of those 50, 32 are 59s and 18 are from 1960. My blonde is, by serial number, a 60, so it is one of 18 in the world. If that doesn’t make you feel a little special, then I don’t know what will. Will I own this one forever? Nope. I’m gonna hold out for a stop tail. My first blonde ES-345. What can I say. She's a beauty. This is what original frets look like. Ideally, the "nibs" should be there all the way up and down the 'board on both sides. They usually aren't because of wear but if the top ones show them and the wire and wear make sense, then you can be pretty certain that a partial fret job wasn't done. 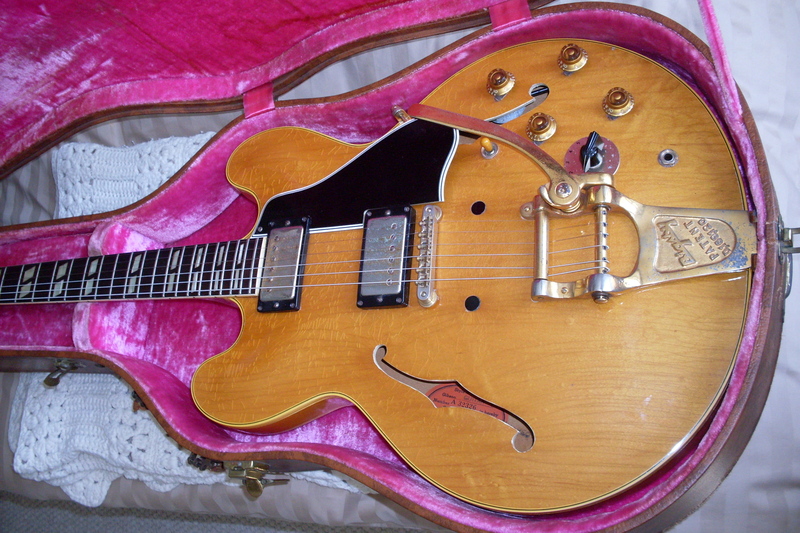 This is an early 65 ES-355. You’ve all seen it again and again. 100% original!! All original!! Just like it left the factory!! And so on. This gets a little nitpicky but bear with me. 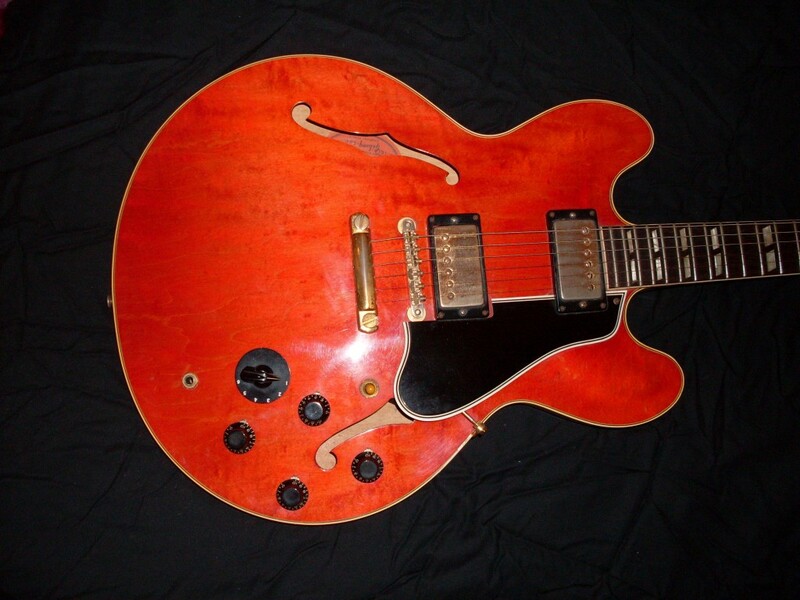 In my experience, I’ve never seen a vintage 335 or 345 that is 100% original. That would mean it still had the original strings on it, right? OK, it’s silly, to be sure. but where do you draw that arbitrary line in the sand? We all understand that the strings are an “expendable” as we say in the film business. They wear out-they get replaced. Nobody cares. Like a light bulb. But is that the end of it? Plenty of things wear out including saddles, bridges, frets, fingerboards, tuners and tuner buttons and even knobs and pickguards. Myself, my line is drawn at the strings and, maybe, the saddles. I, for one, have a hard time telling if they are original or simply correct. Its usually pretty obvious when they don’t match but unless you’re dealing with a mint or near mint piece, I don’t think it matters much. I don’t have a big problem with replaced tuner buttons either, although that should always be disclosed-even if you only suspect that they have been replaced. Go back and read my post entitled “Shrunken Heads”. That brings us to frets-another subject I’ve offered up in the past and here’s that post. 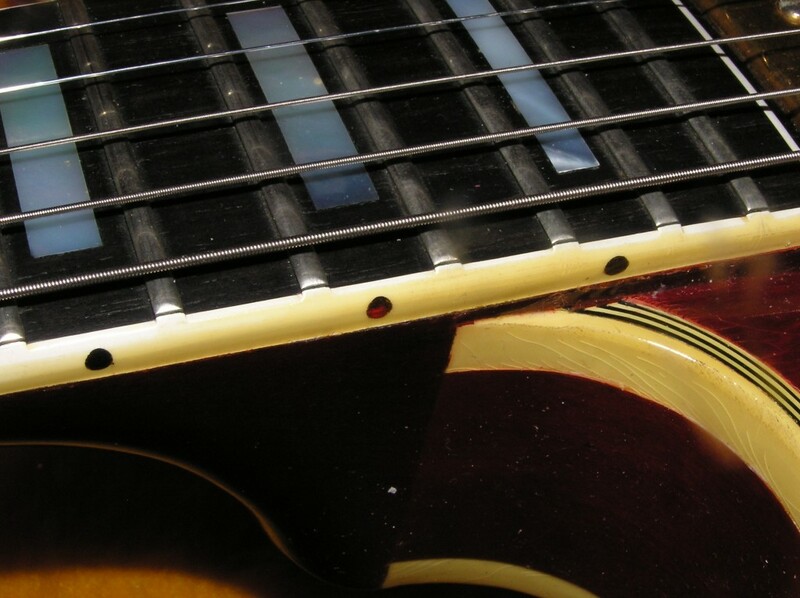 Why should frets be any different than strings? They wouldn’t be if every fret job went to a competent luthier but there is a huge range of talent out there from brilliant technicians who elevate the refret to an art form to amateur hacks who should ever be allowed to wield a fret file. Always ask for photos and if it has had a fret job, it isn’t 100% original. As I said, I think I draw the line at the strings. But, on the other hand, I don’t have much of a problem with parts that are correct on anything but a museum quality piece. Yes, it’s nice to have a guitar that is all original but these are, for the most part, mass produced parts. It’s tough to have a favorite volume knob-they are all the same. And you couldn’t tell anyway if one had been replaced early in the life of the guitar. For sure, when one looks new and the rest have the letters worn off them, you might want to question the originality but, in general, I will accept correct in place of original. I’ve had more than one argument over that-especially with regard to pickups. It all gets figured into the price of the guitar and it all gets disclosed to a potential buyer. I get kind of excited when I come across a mint guitar with all the case candy intact and a set of flatwounds on it. That usually means little or no fretwear and a player who was likely not a rocker (do rockers abuse their guitars more than jazzers? You bet). But I wouldn’t go nuts obsessing over original v correct because there is no way to know in most cases. 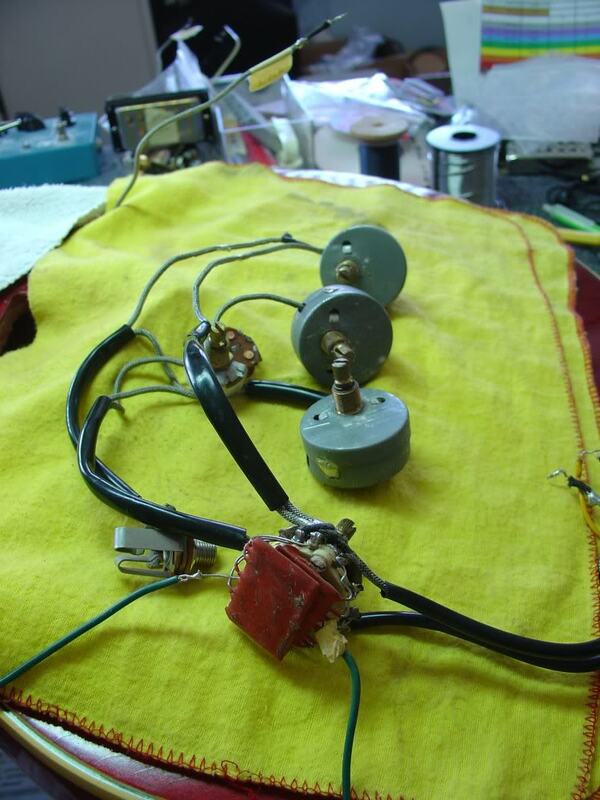 Yes, there the solder joints for the electronics and wear patterns for the knobs and pickup covers. You can usually tell a refret from the bindings and the fret wire condition vi a vis the wear on the guitar. But a correct bridge? Or saddles? Or stoptail/Bigsby? Or tuners? Good luck. I’m a pretty good detective but I’m not that good. All you can ask yourself, as a buyer, is this: “Am I happy with the guitar considering what I paid” If the answer is yes, then sit down and play. 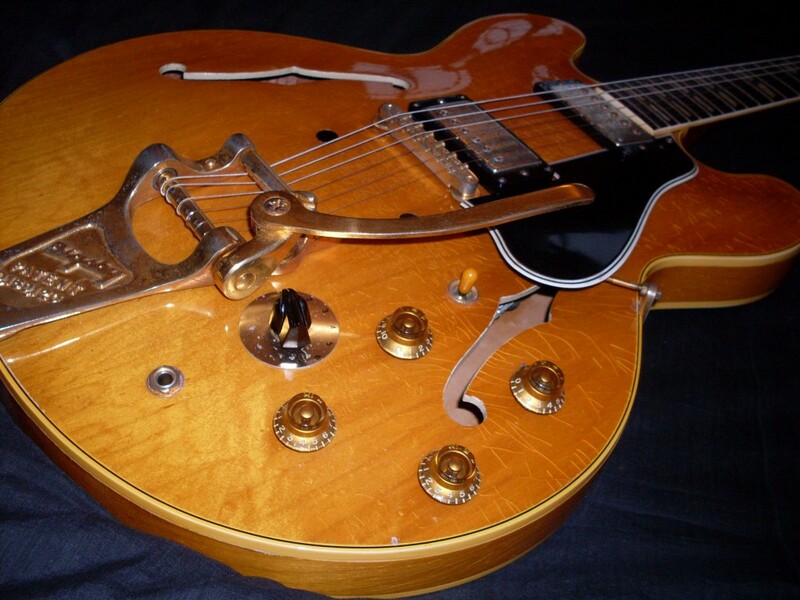 Take a look at the saddles on this 59 ES-345. The A string saddle in definitely not original, nor is the screw but what about the rest of them. 52 years is a long time not to lose a saddle or two on a no wire ABR-1 especially on a guitar that was really played like this one. And yes, I can see that this is a wired ABR-1 that is missing its wire. I never said it was 100% original!! This was taken while standing in my driveway looking away from the water. The water got another 6 inches higher after I took the photo. over the weekend. I’ve got some cool storm photos which I’ll put up later. 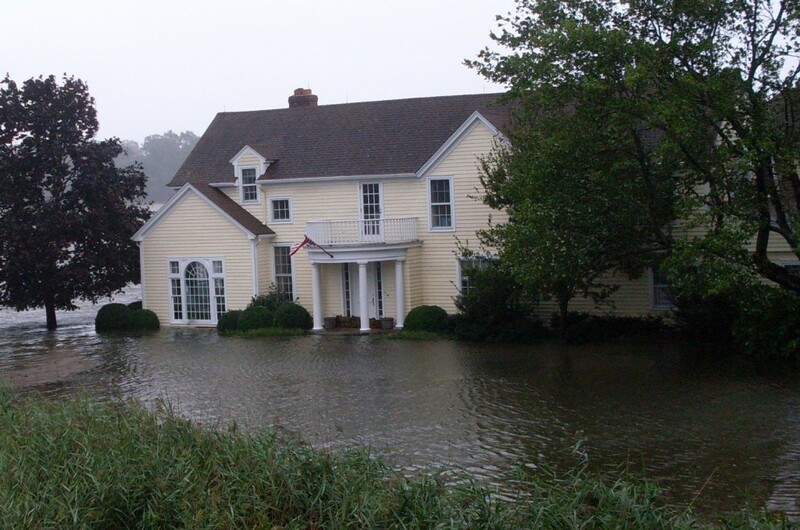 The water was about 4 and a half feet deep on my street and, being salt water, it killed my lawn and probably most of my roses (I don’t just play guitar-I have other stuff I do). And the mud. There’s this fine silt that is everywhere-especially under the house and in the garage which flooded. 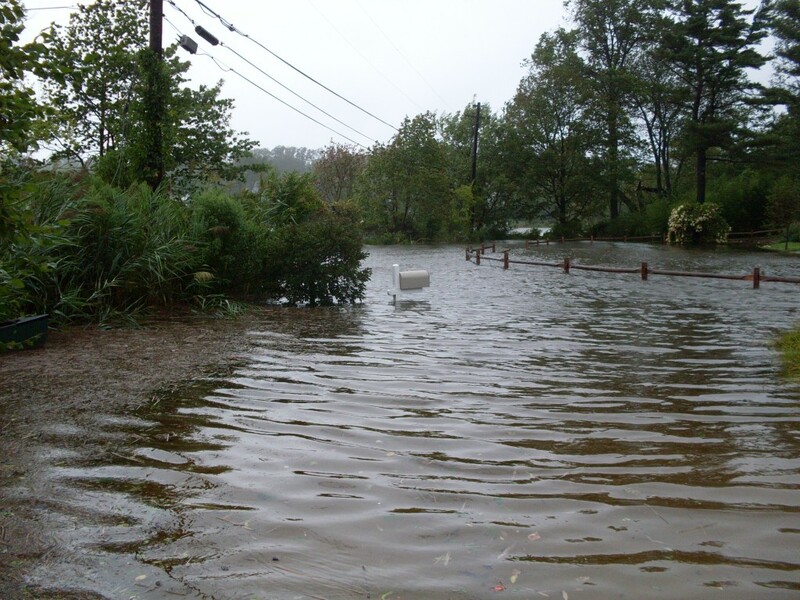 The backyard, which faces the water, is a mud flat and there is (are?) debris everywhere. Don’t get me wrong, I’m not complaining-not even about hauling all the furniture upstairs. I was right that we didn’t need to but it was close enough that I’m glad we did. No electricity means no loud guitars, right? Not true. My little generator was able to power my hot water, some lights, a little refrigerator and my little Supro Spectator, so there was rock and roll for the neighborhood.